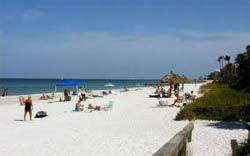 Naples is situated on the southwest coast of Florida south of Fort Myers and St. Petersburg and is known for proximity to the Florida Everglades. Naples offers amazing sunsets, shopping, championship golf & white sandy beaches. Attractions include King Richards Family Fun Park where you can find the following: alligator pit, batting cages, water rides, amusement rides, go carts, huge game room, kids water playground. Naples is a beautiful diversion from the busy parts of Florida.